Nikolaos Blackwood swore he would bring to justice the drug dealer known as Dodger. As Ghost, one of Thunder City's alternative human defenders, it was Nik's responsibility to keep his high school classmates safe. That included notorious bad girl Daniella Rose. Ten years later, he needs to locate Daniella to deliver an urgent request from her estranged family. Dr. Daniella Rose finally believes she can lead a normal, happy life and focus on her relationship with Nik Blackwood — the one man she's always wanted but could never have. Now that she's back in Thunder City, she'll do anything to keep him — except reveal her hidden Alt ability to shapeshift into Dodger, a secret identity she killed before graduation. When a drug lord from Dani's past threatens Nik's life, Dani knows she'll have to resurrect Dodger to rescue her man, even if exposing her secret could cost her Nik's love — and her life. 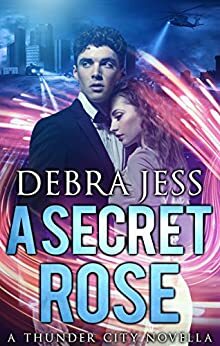 A Connecticut Yankee transplanted to Central Florida, Debra Jess writes science fiction, romance, urban fantasy, and superheroes. She began writing in 2006, combining her love of fairy tales and Star Wars to craft original stories of ordinary people in extraordinary adventures and fantastical creatures in out-of-this world escapades. Her first published novel, Blood Surfer, has won the National Excellence in Romance Fiction Award for Best Paranormal and Futuristic. Debra is a graduate of Viable Paradise and is a member of Codex. She's also a member of the Romance Writers of America and RWA's Fantasy, Futuristic, & Paranormal chapter and the First Coast Romance Writers. 4.0 out of 5 stars"A Secret Rose": Visit Thunder City for Romance, Action and Superheroes! I've been reading the Thunder City series of novellas by author Debra Jess for quite some time. I really enjoy the unique hybridization of romance and superhero speculative fiction. Jess excels at creating utterly believable, albeit super-powered, characters who do as best they can, despite obstacles, live their lives, want to be with somebody special and enjoy their lives. "A Secret Rose" focuses far less on over-the-top, four-color brawls from the comic books and takes a much much more subtle approach to character development. The plot is very brisk, at times almost too fast, but enough information is provided to the reader to follow along. I found the characters to be quite compelling and I immediately sympathized with both main characters. Having read the prior novellas in the series, I especially enjoyed the allusions to prior events in the books. Jess has created a remarkably consistent, vibrant and entertaining world in Thunder City. In short, this is a quick, but very enjoyable read in the series. Jess continues to create more wonder in Thunder City and I'll continue visiting. Another exciting adventure in Thunder City! Dani Rose puts a whole new spin on super powers as she phases between male and female, testing the love and limits of those around her. She's a real trip - sweet one minute and feisty the next. She has to overcame some major issues from her past. Thunder City favorites make some cameos in this book, so every page turn was a real treat. If you love Debra Jess and her Thunder City alts, you've got to read this. 5.0 out of 5 starsLove the Thunder City Series! I enjoyed reading Nik and Dani's story. I definitely recommend reading this series. If you're looking for a story to escape into, the Thunder City series is it! Blood Hunter is next - can't wait! Another installment in the Thunder City Universe showcasing a unique new heroine. Thought provoking, action packed, with a satisfying romance. I really loved the first book in this series and "A Secret Rose" plot sounded cool. I love the idea of a woman who can 'phase' into a guy (it's like her superpower). This new Thunder City book delivers intrigue, a hot love story and a main female character, Dani, who is not a good guy or bad guy, but something in between. Her gender bending abilities added a different and interesting twist to this sci-fi themed novella. I'd like to read more about Dani and Nik and this book just whetted my appetite. I received a free copy of this book in exchange for an honest review. I was not compensated for my review. The opinion expressed here is my own.